Add a delicate touch of vintage décor to your home with this beautifully detailed personalised scroll porcelain bucket. A miniature sized pot with endless possibilities, the bucket has a metallic silver handle . The scroll design across the front of the bucket gives it a classic and artistic feel. The perfect gift for multiple uses including storage of anything from jewellery to brushes and combs, small potting plants or even as a kitchen tidy. 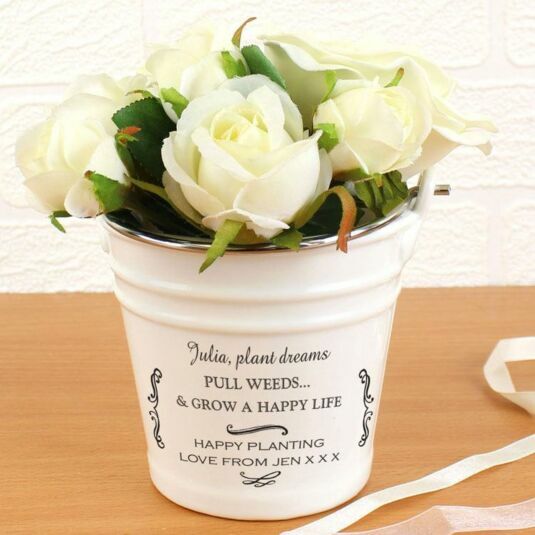 Ideal as a gift for a wedding, as a house warming present or for Mother’s Day.